There is a bit of uncertainty of how granolith should be spelled. I've seen it listed as granilith, granalith, and maybe even a few other ways, but I prefer granolith - similar to monolith. The granolith is first mentioned in the episode 'Suprise'. Vanessa Whitaker demands that Isabel give it to her, but Isabel has never heard of it. 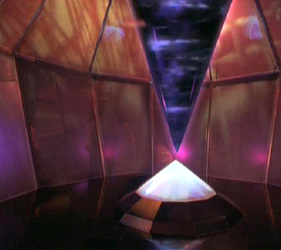 Later in the episode, Isabel finds it in a secret room behind the pods in the pod chamber. The Granolith is never exactly explained in the show. The destiny book tells that the granolith only has one mission, to take the royal four back to their planet, but can we believe that? After all, Tess left that 'translation' of the destiny book on the computer. Maybe she altered the translation so they wouldn't know how valuable the Granolith really was. It seems to have a lot of power and a lot of different people wanted it for it only being a one use item. - The Skins wanted it because they were dying - so could it help heal them, or were they wanting to use it go home? - The representatives at the summit were very interested in it too and were shocked to find it wasn't on Antar but on Earth. - Khivar wanted it so badly that he made it's return to Antar one of the conditions for peace with Max. We are told a couple of things, but can we trust them? Lonnie tells Max the Granolith is a religious icon like the holy grail, and the people of their planet worship it. But who knows if that is true. And we know that Serena altered the Granolith so Future Max could use it to come back in time (if the whole future Max thing wasn't a mind warp or trick). FMax tells Liz that it tore a hole in time-space. I personally believe there must have been a lot more to the Granolith than we were ever told. What it really was we will never know, but there have been many theories. Some believe it is raw power that can be used in a variety of ways, or it can draw or focus power from people or a planet. Some, myself included, have made the Granolith a living thing with thoughts and agendas of its own. Others have specualted that it could be a collection of the spirits of people passed on. How does the Granolith Work? In the episode 'Departure' Max inserts the crystal into the base of the granolith, and it acts as a 'starter key' that activates the granolith. Once it is inserted into the base of the granolith, it takes 24 hours for the granolith to prepare to return to the alien's home planet. However in the episode 'EOTW', when Future Max inserts the crystal, the granolith starts right up. Is there some reason that it was ready to go so quickly that time? Or perhaps someone delayed the departure of the granolith in the episode 'Departure' for some reason. Some people seem to think that the granolith needed to 'warm up' or build up power for the journey across space in the episode 'Departure', and that is why it took longer. Possible, I guess, but it would seem to me that tearing a hole in time-space to travel back in time would probably take just as much energy if not more. Also it seemed to function a bit differently in the two episodes in the way that the travelers entered it. In 'EOTW', it doesn't appear that Future Max touches it after inserting the crystal, but suddenly he is inside it. Then in 'Departure' Tess has to touch it before she is taken inside. Not to mention that Future Liz reaches out to touch it in 'EOTW' but is not taken inside. It is unclear if she actually does touch it, but it looks like she does. We do see in both episodes that the traveler is 'sucked' or beamed inside the granolith for the journey. It makes you wonder if it is similar to Dr. Who's Tardis and is bigger on the inside, because it doesn't look like four people would fit inside it. Have you ever wondered where the Granolith came from? We don't have a lot of clues, but I think this may be one. If the Granolith is so great and so many want it, why haven't they made another one? I think they would have if they could. I believe they couldn't duplicate it. Maybe the Granolith was made from techonolgy that was lost, or perhaps they didn't make it at all and it originally came from somewhere else so they couldn't make another one. Was the Granolith on the ship that crashed in '47? Another theory that is all my own. There is no way to know this for sure, but perhaps the Granolith came to Earth earlier than on the ship that crashed. It wasn't captured by the military with the shapeshifters and pods, so likely it wasn't in the crash. Either it came to Earth earlier, on another ship, or, it was put in the pod chamber before the crash.